Last year British media predicted birch sap, or birch water, to be the coconut water of 2015: a worldwide drinking trend. Finnish company Nordic Koivu was onto it before others; they’ve been exporting birch sap for over a decade. When Arto and Susanna Maaranen started planning on a family, they wanted to move to the countryside. They were on the hunt for a place close to nature for their future children to grow up in, but also a source of livelihood. ”Whilst looking for a house we listed all possible business ideas for making a living in the country,” tells Susanna Maaranen. The best idea was found in their very own garden. The newly-found house in Tohmajärvi, Finland was surrounded by a beautiful birch forest. Maaranens didn’t want to chop down the trees, and the thought of sap came to mind. Now Nordic Koivu’s certifiably organic, free-of-additives and without preservatives, non-pasteurised sap is being drunk around the world. 97 percent of their production travels to Central Europe and Asia. Arto and Susanna Maaranen moved to their birch-abundant house in 1996. At the time they owned a company called Aurinkolehto, but they were constantly gathering information about birch sap from experts in different fields all over the world. The first version of the automated collection and production lines was installed in 1999; the first commercial products were sold two years later. In 2002 Aurinkolehdo was awarded the president’s InnoFinland award, and they have also been nominated for The Outstanding Young Farmer award. Ten years ago the company gave up its other lines of work and focused only on birch sap production. Sap has gained interest among the more and more health-aware consumers. According to Susanna Maaranen, birch sap has long been used to treat different health-related issues. ”There’s no scientific research on the health effects of birch sap, and we’re not even trying to claim it’s a medicine of any kind. It’s a healthy natural product,” Maaranen emphasises. 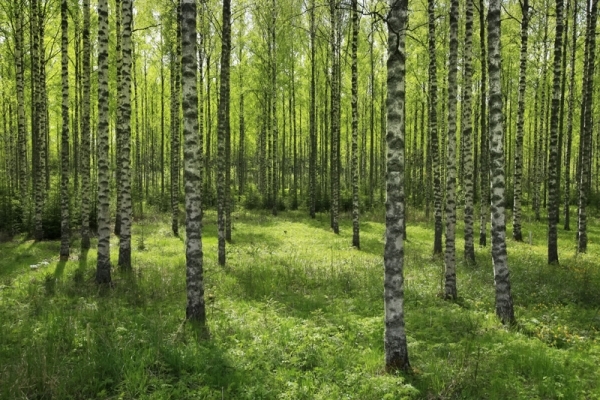 The Central European customers of Nordic Koivu recommend birch sap for body cleansing and weight control. 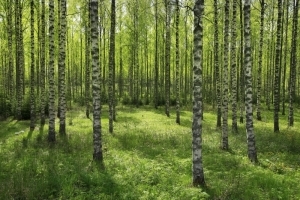 In cosmetics birch sap has been said to help the renewal of skin cells. The first bottles of birch sap came from the trees near Maaranen family’s house. When the production was moved to a new premise, the sap was extracted from birch trees in areas rented from the municipality of Tohmajärvi. The production moved to new premises in 2012, and now the collection is done by subcontractors. Forest owners in Tohmajärvi area collect the sap using Nordic Koivu’s technology, whilst the owners focus on production, product development, and marketing. 2015 is, again, a year of change for Nordic Koivu. In the minds of some consumers, a glass bottle of organic birch sap might have seemed luxurious. Soon the company will launch a product with supermarkets in mind. ”The price of the new product is suitable for supermarkets. This way we’ll reach a whole new level of volume,” Maaranen says. Unlike the bottled product, the new line will be packaged aseptically into cans. This means they will be pasteurised, then citric acid and, in the case of berry products, fructose will be added. The new concept means new flavours, too. Birch sap will be accompanied by combinations of birch sap and wild blueberry and birch sap and wild lingonberry. Like birch sap, both berries come from Finland and are organic. The sap is collected from trees using an automatic system. A truck takes the sap to the factory, where the bottling and packaging processes are automated as well. The harvesting period lasts, at best, only some weeks. In order to extract sap, holes need to be drilled into the tree. According to Maaranen, this doesn’t damage the birch. It’s easy for the owners to supervise the productions, since everything is made in Finland and, as much as possible, locally. Only bottles and caps come from abroad. With the new concept Nordic Koivu aims at growth both at home and internationally. The company targets those European countries that yet remain untouched, and in Asia for example China, Japan, and South Korea. “I believe there’s room for significant growth in Asia. Australia and North America offer potential for our product too”, Maaranen says. In the domestic market Nordic Koivu’s consumer products have been marginal until now. The growing selection of products is coming with the hopes of increasing the presence in Finland. Growth means more work. Although the marriage is over, the Maaranens still work together, Susanna in sales and marketing and Arto in production and administration. Currently they have six employees year-round, but in the harvesting period 12 employees are needed for bottling alone. The new production concept will also lead to an increase in the number of staff. Being Finnish plays an important role in Nordic Koivu’s international image. This is visible in the name of the company. © Vesa Moilanen / Lehtikuva Medieta has launched a prototype of its medical health bracelet which measures a patient’s biosignals and predicts the risk of complications. It has been developed in cooperation with several hospitals and healthcare professionals. Finnish biomedical startup Medieta has an ambitious goal: to reduce healthcare costs while optimising patient care and increasing efficiency. The key to this is the company’s unique medical health measurement bracelet ‘ErrS’. “The company was born in 2012 out of medical frustration,” explains the CEO and Co-Founder of Medieta Jouni Ruoppa. To answer this challenge an idea was born for an easy-to-use, wireless medical measurement bracelet to enable remote patient monitoring. Two years later the prototype bracelet is in test use in two university hospitals in Finland, and Medieta is getting ready to launch the final product in late 2015. The ErrS bracelet is equipped with GPS and measures several different biosignals, like blood pressure, heart rate, respiratory rate and oxygen saturation. The measurement data is transferred in real-time to Medieta’s cloud-based platform where the assigned doctor or a nurse can check the measurement data. They also get alerted if any anomalies or significant changes are detected in the patient’s vitals. In addition to data gathering, the system analyses the collected data against Early Warning Score Tables, which are widely used in hospitals, and predicts the development of possible complications, such as cardiac arrest. The remote monitoring makes it possible to discharge hospital patients earlier and reduces unnecessary hospital visits. This not only improves the patients’ wellbeing but also brings substantial cost savings when fewer hospital days are needed and resources can be allocated more efficiently. Furthermore the data can be used to determine correct medication and treatment needs or in some cases even to see whether a patient has remembered to take their medication. “We can increase the efficiency of a hospital by up to 40 percent. Patients can be safely transferred from intensive care or discharged earlier since there is a reliable way to remotely monitor their vitals,” says Ruoppa. While the bracelet is still under development, the promising prototype has already raised international interest. In the UK pilot tests are scheduled to start in the next few months and similar discussions are currently under way in the US. For now the US and the EU are the primary target markets for the company which employs around 30 people in its teams in Finland. In the US alone, missed critical warning signs and unnecessary visits to the doctor add over 130 billion dollars in annual costs to the healthcare system. “In total we are looking at a huge market. That will keep us busy. We have received lots of enquiries from China as well, but that time will come later,” says Ruoppa. While the bracelet is packed with features also suitable for fitness tracking, Medieta’s plans do not include expanding to the consumer market. Instead, the company envisions different versions of the bracelet which could be prescribed by doctors not only to existing patients but also to people belonging to high risk groups. “Healthcare needs more automation and better abilities to intervene at an early stage. We want to start an evolution in healthcare similar to what happened in communication when we moved from landlines to mobile phones or from physical banks to internet banking,” says Ruoppa. Oppex The database of Oppex includes more than 3.5 million public sector tenders and more than a million are added every year. The company believes it is already the world’s largest source of tenders. Sometimes it takes being boring to be successful. This is what Ville Heinonen and Mikko Lehmuskoski have found after co-founding Oppex, the “world’s largest source of public procurement notices”. “Public procurement is a totally boring area for a startup which is exactly why we thought there must be something great about it,” says Oppex CEO and Co-Founder Ville Heinonen with a laugh. In practice, Oppex is a global search engine for public procurement tenders. It helps companies to find sales opportunities from both local and international government contracts. For example a user types in a search word related to their industry and the results show all relevant tenders from over 100 countries. The service aggregates thousands of new public tenders daily and translates them to English from around 50 languages. This is exactly what gives Oppex a competitive edge compared to other similar services. “There aren’t many other global services in this field, but what makes us unique is that no one else offers English translations of public tenders. With our service, companies can find any public tender, no matter what the original language is, explains Heinonen. It seems the company has found the right approach. Despite only being launched publicly in November 2014 (after a few years of testing) the service already has thousands of business users from 120 countries. Oppex has come a long way since 2009 when Heinonen and Lehmuskoski, who met 10 years earlier while studying together, started the company. The first iteration of the service was born three years ago – coded by Lehmuskoski himself. “During the first month of using the service, one of the test users found four interesting tenders from Poland, Germany and the Czech Republic. Four months later they had already closed one of the deals, worth 300,000 euros,” says Heinonen. The duo quit their day jobs to become full time entrepreneurs. Now Oppex employs 10 people in its headquarters in Helsinki and abroad and is constantly looking for new talent, from coders to digital marketers. “The next step for us is to speed up our internationalisation and marketing. Our aim is to be a globally well recognised company in our field within a few years,” Heinonen says. These ambitions are spurred on by a 1.2 million euro seed funding from media company Alma Media, startup accelerator Veturi, the Finnish Funding Agency for Innovation Tekes, and seven angel investors. Oppex’s first marketing pushes will be targeted at the UK and Germany as they have been successful test markets for the company. However, as the public procurement process is very similar all over the world, potentially there is no limit to where the company can go. Oppex’s database currently includes more than 3.5 million public tenders and the company claims it’s already the world’s largest source of tenders. While traditional industries like healthcare and construction represent major areas of public procurement, the variety of tenders and business the company is seeing has taken Heinonen by surprise. “Sometimes it takes me a few minutes to even understand what a company does,” he laughs. Maybe public procurement is not so boring after all. Alisha Hasan from Finland established a company in the UK that stands for luxury sports fashion and produces all of its garments ecologically. Two years ago, Alisha Hasan decided to realise her dream, which many thought was a tad grandiose. She established a fashion company named Dreams & Doors that manufactures ecological sportswear in the UK – and has decided to make it big. The thought had been smouldering in her for years: active in tennis and rowing in her student years, she wanted clothes which would make a sporty woman look classic and chic. The existing markets failed to respond to her need to look elegant and feminine in sportswear. “I want to offer people outfits that they can easily wear for a bike ride into town and for a drink after their sports session,” Hasan says. The company is just in its infancy, but Hasan believes she is uncovering a gold mine. According to her, there are currently no other manufacturers using similar organic fabrics in their sportswear lines. Hasan designs her ecological sportswear pieces herself. The fabrics are imported from India and Turkey, among other countries, and the garments are produced in the UK. Hasan wants to support companies specialising in sustainable development and small British textile factories. “The fabrics are either herb-dyed, i.e. totally chemical-free, or OekoTex-certified, which means that the minor amounts of chemicals used in their manufacture do not cause any detrimental impacts on the environment,” Hasan explains. Producing ecological garments is neither low-cost nor easy. Due to the availability of the materials, Hasan needs to proceed in a reverse order compared to traditional fashion labels: she buys the fabrics first and then creates her designs, and not the other way round. Hasan describes her customer as a sporty career person aged 20 to 35 with an active life and a playful style. They are also quality-conscious and care about their health and the environment. Dreams & Doors is a luxury brand which enjoys a large potential customer base at British sports clubs. “Also creating a men’s collection right off the bat was a strategic move, because market opportunities are certainly not in short supply when it comes to men’s fashion,” says Hasan. The first collection was launched last summer and the pre-sales of the spring/summer 2015 collection have been growing steadily among both customers and distributors. As of early summer, Hasan’s garments will be sold in London’s high-end Equinox fitness clubs, and the network of co-operation partners was further expanded at the Ethical Fashion Show held in Berlin in January. “We had booked several meetings with local eco-fashion retailers during the fair. The purchaser of the German store Phasenreich and the founder of the Monagoo distribution channel visited the fair just so they could meet our team,” Hasan says. Raised in Finland, Hasan completed her Master’s degree in economic science in London. She thinks of the UK as her second home and lives in London. Establishing a company in the UK was a natural choice, as the largest markets for her products can be found outside of Finland. However, it is important for Hasan to let her Finnish roots and the Scandinavian aesthetics shine through in her designs: in her future collection she intends to use reindeer leather produced in Finland for its quality and unique characteristics. Hasan also wishes to collaborate with Finnish designers. She has already signed an agreement with Mari Kasurinen, an artist and graphic designer known internationally for her My Little Pony designs. “Mari will design a new dedicated character for D & D’s future collection which will be targeted especially at Japan and South Korea. We want to create a new kind of Finnish design identity, one that is more global and focussed on detail,” Hasan says. “One of my favourite print designers is Klaus Haapaniemi, who created the Taika range for Iittala. Each of his pieces tells a story. I want to achieve the same expression in my garments, and I’m not likely to run out of stories and wild ideas anytime soon,” Hasan says, laughing. – Paula Caetano, Diretora Técnica – Humanize – Cuidados de Saúde Lda. A Câmara de Comércio preparou um e-book para apoiar as empresas a maximizarem a sua participação em Missões Empresariais. Dividido em 3 partes (antes, durante e depois), este e-book dá-lhe várias dicas e alerta para temas que são importantes ponderar nas 3 fases da participação. A rede Team Finland tem por objectivo a promoção da Finlândia no mundo: a internacionalização das empresas finlandesas, a captação de investimento internacional e o aperfeiçoamento de imagem da Finlândia. A rede reúne os actores e serviços em áreas de negócio diversificadas. O núcleo da rede é formado por organizações com fundos públicos como os ministérios, embaixadas, Finpro, Tekes, institutos da cultura e da ciência da Finlândia, Finnvera, Finnfund, bem como os serviços de internacionalização regionais. A rede Team Finland presta apoio na internacionalização das empresas, no crescimento e na obtenção de sucesso a nível mundial. Mais informações sobre os serviços de internacionalização para as empresas em: palvelut.team.finland.fi. A economia portuguesa está numa fase de transição, cujo objectivo é o de corrigir os problemas estruturais, melhorar a produtividade, competitividade e melhorar a posição de financiamento do país. Apesar dos desafios da economia, algumas áreas apresentam boas possibilidades para novas empresas, sobretudo nas áreas das tecnologias do ambiente e energia, tecnologias de informação, serviços de bem-estar, turismo e tecnologias do mar. A Team Finland apoia os esforços das empresas finlandesas na exportação e nos investimentos em Portugal, como também reforça a imagem da Finlândia sobretudo junto dos intervenientes especialistas na economia, investigação científica e ensino. A Embaixada disponibiliza informações sobre a Finlândia, através das suas páginas oficiais e perfil no Facebook, para além de distribuir material informativo impresso. A Team Finland presta especial atenção à diversificação e atualização dos artigos e notícias publicados em português.